One of the best places to play in SL. With the beautiful valley and the more surreal, artistic hidden areas, Unintended Water feeds the imagination. Great sim, made by Cyro Spyker and me. 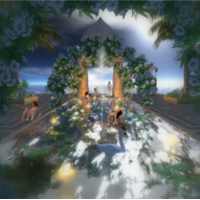 If you have works of Unintended Water to share, you can send a Postcard or add them the SLurl. Get the Unintended Water Widget!